Now, don’t get me wrong. My own original literature review began exactly the same way. It was rambling, overly long, inchoate, disorderly…leaving readers impatient for me to “get to the point!” I had good excuses for that. After all, I had bit off an giant chunk of ideas to chew on: sociological theories of agency, historiography, feminist theory, and women’s history; all of which I intended to bring to bear on a field that by its very nature had given very little thought to any sort of theory at all: journalism history. And oh yes, I forgot, I also had to cover various approaches within communication theory as well. Needless to say, “cutting to the chase” was a long, drawn-out process struggling with decisions to cut prose with which I had become enamored and that seemed indispensable — to no one else but me. I went looking for something to help explain to a new client the problems with her literature review and to offer some ideas on how to resolve it, and happily came across this wonderful article, “A Guide to Writing the Dissertation Literature Review,” by Justus J. Randolph of Walden University. As Randolph writes in his abstract, “Writing a faulty literature review is one of many ways to derail a dissertation.” It is also one of the many ways to cause your editor to tear her hair out! 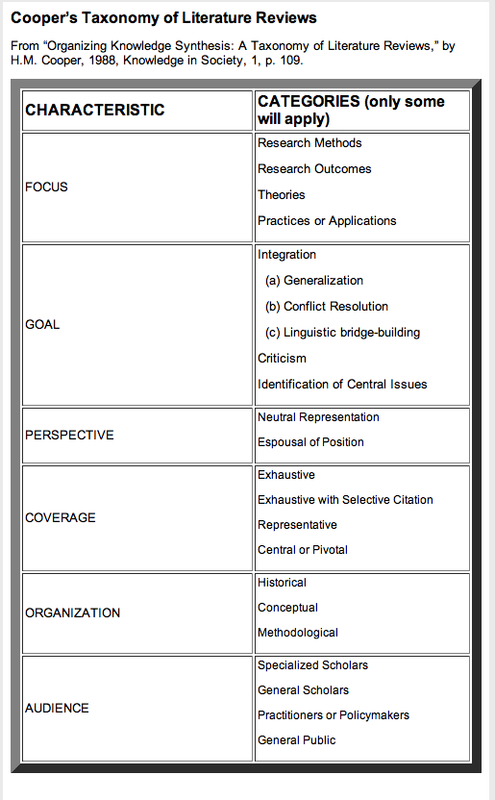 A Guide to Writing the Dissertation Literature Review. By Justus Randolph. This article provides a terrific taxonomy of the different kinds of literature reviews, and approaches to writing them. Little did you know that there are many ways to accomplish this task, with the choice depending on your audience(s) and purpose. This chart seems overwhelming! But don’t be afraid. All it is doing is laying out some simple questions you should ask yourself before beginning a Literature Review. For example, the first row, “FOCUS,” is asking what outcomes, methods, theories or practices your literature review is about. Are you tracking the outcomes of previous studies, the methods that have been used over time, or something else? You don’t need a definitive answer to all these questions, but they will help focus your research. Which of these characteristics seem to fit within your field? What would you like your Literature Review/thesis/dissertation to accomplish? Is your aim to influence theory within your field, or have specific application? Does your field necessitate a particular perspective? How does your field typically organize its findings? that your work will lead to new knowledge. Hoftsee has some very helpful suggestions for how to organize your literature review and select the materials to include. This one is a bit simpler and easier to understand than Randolph’s, but both are useful. Indeed, I plan to make the both of them required reading for all new dissertation clients! So get busy! This entry was posted in Organizing the dissertation, The Literature Review, Writing the Dissertation and tagged organizing the dissertation, writing the literature review on January 20, 2013 by matrixedit.